Excellent for families with young children. Nice pool, very close to the beach, excellent service. That it was close to the beach. But there was Way too much rubbish at the beach, Which I really did not like... My kids really liked the pool. The accommodation is just perfect if you are travelling with toddlers. The play area and the baby pool was a super hit with our children. The units are spacious which is cleaned everyday by some wonderful housekeeping staff, a kitchen with kettle, cooker, microwave and oven in case you want to cook. Its ideally located with the local beach 5 mins away, the port is 20 mins away where you have the local butcher who sells meat, cheese and local produce from the farmers. The port also has a supermarket and some wonderful restaurants. You could also buy club sandwich, ham burgers and finger food at the property on days you don't want to step out. Marcus is a brilliant host and his team do a fantastic job of taking care of all his guests and their requirements. Would highly recommend this property if in Kea. Look no further! The owner was very friendly. Views were nice. There were lots of amenities at the complex including being able to order food (and buy water) at the pool. This would be a great place for families with or without kids. We enjoyed the location. We rented two units.. the luxury two bedroom with the kitchen was definitely worth the upgrade. The beach is just a short walk away. Glad we chose to stay at Anemoussa!! MY WIFE AND MYSELF ENJOYED ALL THE PROPERTY'S FACILITIES ANA ACCOMODATIONS, FELT ABSOLUTE RELAXATION AND CALMNESS AND LOOK FORWARD TO VISIT ANEMOUSA IN THE FUTURE!!!!! Anemousa studios, were lovely, we really enjoyed our stay here. They were very accommodating and let us check in early and check out late. It was brilliant, would highly recommend! Thank you! Despite the pool being out of use, the owner let us borrow sunbeds for the beach and also drove us to town to rent a car. The location was good, with lovely beach and two tavernas nearby. The pool was very nice and clean. The premises were exceptionally clean and well maintained. Friendly and helpful owner on site. Room was wonderful,spacious,with good shower and kitchen. We stayed at second floor,what was better than first floor. Pool area and garden was well kept. Family hotel with relaxing atmosphere. 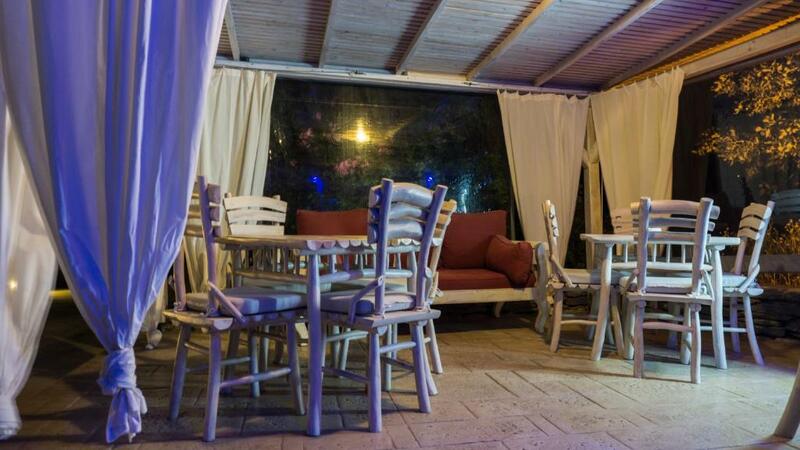 Location to a wonderful beach and two great restaurants. Clean. Pool area. Spacious self catering rooms. 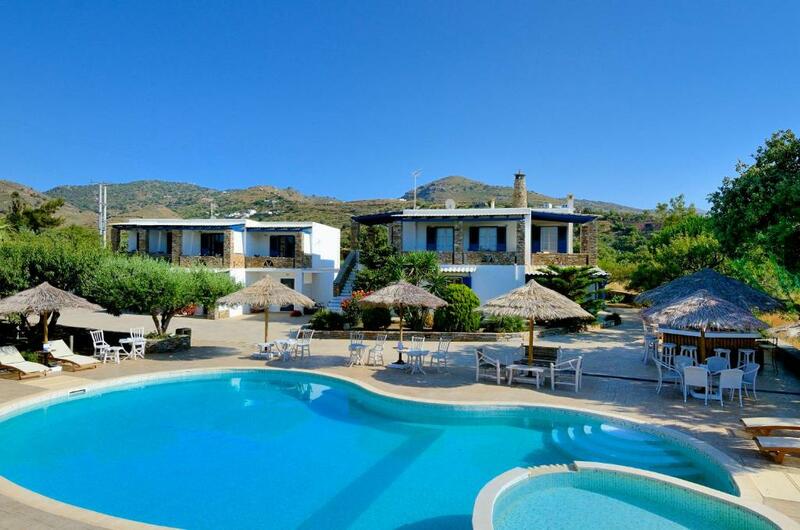 Lock in a great price for Anemousa Studios – rated 9.3 by recent guests! Anemousa Studios is a Cycladic-style guest house, located just 350 feet from Otzias Beach in Kea Island. Offering self-catering accommodations with free Wi-Fi, the property features a swimming pool with bar and free sunbeds amid its lush gardens. The simply decorated studios and apartments open up to a furnished balcony with garden and pool views. Each includes a dining area and a fully equipped kitchen, giving you the opportunity to prepare your own meal. Daily cleaning service is provided. Staff at the 24-hour front desk provides car rental and tour desk services. Guests can freely use the BBQ facilities, while children can enjoy themselves at the children’s pool or at the on-site playground. 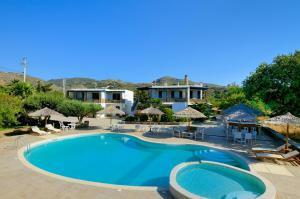 Anemousa Studios is located 6.2 mi from the capital of Kea and 3.7 mi from Korissia port. A mini market and restaurants can be found within 350 feet. Free private parking is possible on site. 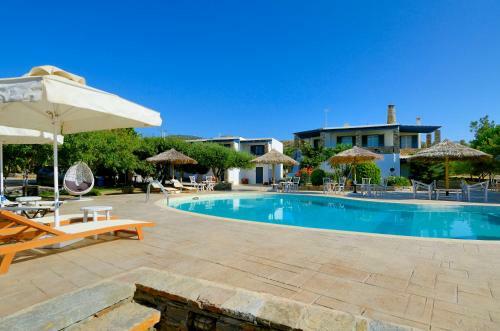 When would you like to stay at Anemousa Studios? Ο κήπος,το pool-bar, και η πισίνα με το γυμναστήριο δημιουργούν όμορφη ατμόσφαιρα και είναι χώροι ιδιαίτερης ψυχαγωγίας για τους πελάτες μας. Η απεριόριστη έλξη που έχουμε οικογενειακά για το τουριστικό κλάδο μας ωθεί να ασχολούμαστε όλη η οικογένεια με μεράκι και αγάπη για την ΑΝΕΜΟΥΣΑ με μοναδικό στόχο τη μεγαλύτερη δυνατή ευχαρίστηση των πελατών μας.Μας αρέσει η μουσική,ο χορός,η γυμναστική και γενικά η ψυχαγωγία. House Rules Anemousa Studios takes special requests – add in the next step! Anemousa Studios accepts these cards and reserves the right to temporarily hold an amount prior to arrival. The beds were a little hard. The swimming pool was also out of use because of a cyclone the week before. The pool was the main reason that we booked the hotel so we felt that the owner could have let us know prior to arrival. The staff and place was lovely. Will be returning. The pilliow was too hard. Very helpful staff and nice clean pool. Good coffee. The room were poor and not interesting. Way too far away from the supermarket or other groceery store. Very clean room, excellent for children with swimming pool and playground. Polite owners and very helpful. Marco and his wife are wonderful hosts. The appartment was very spacious and we enjoyed our stay very much. Thank you Marco! Lots of aunts in the room!!! No assistant s for carrying the luggage!!! Specially for older people!!! Lots of noise coming from the pool! !limited room service ,,,,limited bar service! Poor location !